The 10-12 year old boys in my Bible Class really blessed me a few weeks ago when they excitedly announced they had begun daily Bible reading - ALL BY THEMSELVES! Can you believe that? I asked them who's idea it was first and they said their 15 year old brother! Marvel again! They couldn't wait to each tell me where they were in their reading. I was bowled over! Obviously I want to do all I can to encourage this MOST worthy endeavor that has life long blessings. As human beings, and BUSY ones at that, I know how hard it can be to stick to something like this. I have often shared here how wonderful it was to read through the Bible last year, CHRONOLOGICALLY for the first time. It's like a new book! For me, having it all in order made such a difference on my understanding and I have loved it so much that I'm still doing it. I use reading programs at http://www.ewordtoday.com/year/ which allow you to pick what you want to read, how and what translation, also when you start. It's fantastic. Hope you try it! Ok, back to the topic... so, knowing how hard this would be for them, first I offered my phone number for the many difficult words they would encounter and just to help in general. I also offered that they can write the words down and bring them to class if they prefer. I wasn't surprised Sunday when I asked how they were doing to hear sad boys say they had let it slip. I told them that making ANY new good habit is difficult and takes a lot of effort, not to be discouraged. I recommended they read starting at Matthew instead of Genesis as it's easier. I hadn't said that when they began, because that's where they chose to start and I wanted to be 100% supportive. Again I invited phone calls. I don't believe in bribery, but this is such a wonderful thing they are wanting to do, that would bless their entire lives, that I sat and brainstormed with my husband last night. This is what we came up with. A way to keep track of our progress keeps people encouraged. Just like the chart in class for attendance and doing their memory work, they need a chart they can tack up on their bedroom walls at home to keep track of their progress and keep encouraged. I personalized every chart for each child and printed ones with the name blank for any adults who would like to join us. I'm sharing the blank one with all of you today! To keep it cheap, they print in black and white on two 8.5 x 11 pages. You could print it on neon paper to make it more fun. God bless your efforts to get to know Him and how to please Him even more than you already know. Understanding they are young, have school and also weekly memory work for Bible class, I wanted it to be "doable". The requirement will be to read 5 verses of their choice each day and it can't include their memory work. If they do that, they can mark the box for that day on their chart. The boxes are the perfect size for small stickers or stamps or just check them off. I will design a poster to prominently displayed in the church. We are a very small fellowship, so I'm thinking right next to the door everyone comes and goes by. I wanted to call it, "Daily Bible Reading Challenge", but my husband says it will be called, "Honor Roll", so people will be motivated to participate and be on it. The first Sunday of each month, anyone who has marked off at least HALF the days in the month will bring their chart to church and be recognized from the pulpit. It's sad to make it only half the days and only five verses a day, but again, the important thing is to get people into reading daily. The rest is up to them and God. They will also get to add their name to the poster for that month and their names will be printed in an article about the project in the local newspaper each month. (So far, the newspaper will print small articles of special church events for free.) Encourage, encourage, encourage!!! Feeling that a year is too long for a child...LOL and many adults!...we decided that we would then divide the year into two six month sections. Anyone who had met the daily and monthly requirements for five out of six months of that period would then get to choose any Christian CD they want (that's available) and the church will award it to them in front of the assembly. We chose CDs because this really is about the young people and that's what they want. Most are from families where that is a luxury. It's also a good way to increase how much of their listening time is building up their walks with God. So, next project is to design the poster. I hope you will pray with me that God will touch hearts in our little fellowship, that many people, young and old, will participate and our relationships with Him will prosper this year. There is nothing to equal the value of having the Word of God living in you so that the Holy Spirit can bring it to your mind when you need it, whether for your own help or to help another. And there's no way to get the Word inside you other than reading it and hearing it. How sad when people are satisfied with only the word or two from the Bible they get each week from a sermon. We don't live our lives seeing how little food we can survive on...why do we try to see how little of God's Word we can survive on, how little time spent with Him, how thin a relationship with Him? Remember, He has told us that He demands first place in our lives or we are not worthy to follow after Him. Matthew 10:37 It's something to think about, and pray about. 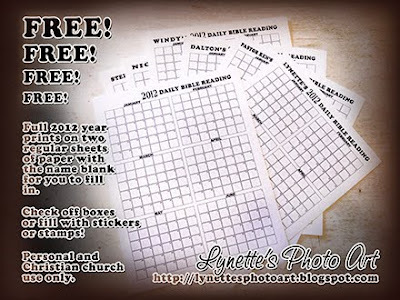 Now go snag this great freebie! 15 “Behold, I am bringing a nation against you from afar, O house of Israel,” declares the LORD. Nor can you understand what they say. All of them are mighty men. I was happy to see this product offered as I’m one of the people who’s physical condition makes peeling eggs very difficult and painful. I have learned to NEVER order anything from the TV or their internet site after several horrible experiences. They did a lot more than send me the product and it took months to resolve. So I waited till I could find them locally. I got them at my Bed, Bath & Beyond today and couldn’t wait to try them out as my husband loves hard boiled eggs. The first negative I encountered was that each egg has FOUR parts. As I washed and dried all four parts for the 12 eggs (2 sets) I’d bought, my drying rack was full of pieces. No – I don’t have a dish washer. LOTS of pieces to clean. The second negative I encountered was reading that you have to grease the pieces – every use…and you can’t use spray directly on them. The third negative I encountered was when I went to put my raw egg in an Eggie. Since there is a cooking chart for the different size eggs, you’d expect to be able to put them in the Eggie. No. I buy large eggs. The yoke alone is too large to fit through the opening and made a huge mess. I then opened the Eggies to just the bottom half. One raw egg filled the half to the brim. I could not have added additional ingredients as advertised. I did add some after reassembling the Eggie. The fourth negative I encountered was that the cooking chart said to cook 15-17 minutes for large eggs and said to start with “warm water”. I started with boiling water and cooked for 17 min. and though they were mostly cooked, they weren’t completely done. The fifth negative I encountered was that though I washed the mess off the outside of the Eggies that was caused by my eggs being too large to go in, somehow egg still got in my pan and made a horrid mess in the pan to clean up. The sixth negative I encountered was that even though I carefully greased every part with oil as directed, NOT ONE OF THEM would release from the bottom cup even though I had greased, cooked according to their directions and was squeezing the bottom cup all around as they said. I had to scoop every egg out with a spoon and it left egg stuck to the inside. The sixth negative I encountered was when I IMMEDIATELY hand washed them. The egg didn’t want to come off the surfaces. It was a LONG job working diligently with washcloth and nylon bristled tool to get all the junk off the Eggies. The seventh negative was that the bacon bits and seasonings I added through the top to some of the eggs, did not mix in. They stayed in a chunk. I guess you’d have to mix it all up in advance and then pour it into the Eggies. It was a good idea, but a monumental amount of work and time. Possibly those with dishwashers would fair better, but I think if they didn’t immediately wash them, that egg gunk would be very hard to remove even in a dish washer. All told, it was MUCH MORE demanding of my hands and my time than just doing it the normal way. Today's gift for you is the Stamped Alpha I recently gave away, just in case you missed it. 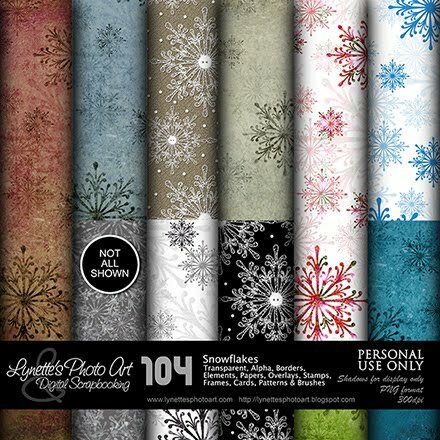 There are 64 pieces to my Delicate Floral Kit, including 25 pages - enough to make a book! $4.99 in my PayPal store. Click the image to enlarge. Click "Buy It Now" button below to purchase it. 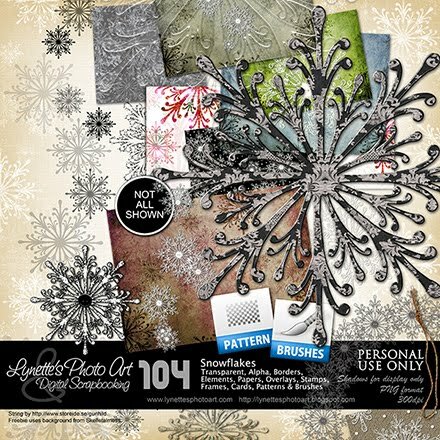 Everything snowflakes you could ever want is in this Snowflakes Kit. It has transparent snowflakes, delicately embroidered snowflakes, snowflake stamps, brushes, patterns, overlays, cards, papers, an alpha, borders, frames, patterned snowflakes, grungy snowflakes, embossed papers and more! 104 pieces - way more than can show in these previews in both grunge, subtle and bright and happy designs. Click the images to enlarge. Click the Buy It Now Button below the images to purchase from my PayPal Store for $5.99. Today I'm giving you an absolutely gorgeous card from this kit to try out. Enjoy it and come back for the kit! String by http://www.storeide.se/gunhild. 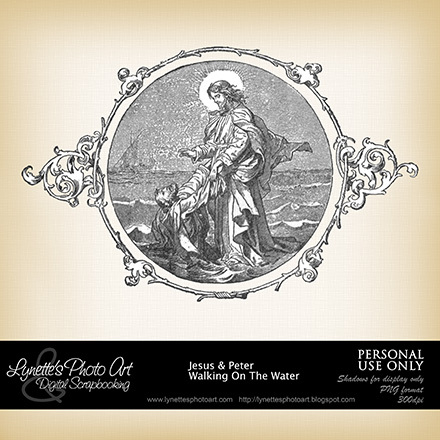 Freebie uses background from Skelletalmess.